The MACD can help you spot trends and momentum, so long you know how to use it right. It can alert you about cash and FNO stocks with solid potential, much before others can latch on to these. But you got to understand its construct and play it right. What are the key components of MACD? So the MACD line represents a difference between 2 EMAs – 12 and 26. This is the default setting. It follows then if 12 period EMA is greater than 26 Period EMA, the MACD line will rise, and if it is lesser, than the MACD line will fall. You need to understand this nature of the MACD line – it is very important. This is the 9 Period EMA of the MACD line. As it is an average of an average, it is slower than the MACD line. Therefore, if the MACD line rises, so will the signal line, and vice versa. The interpretation is same as the MACD line. MACD Line (minus) Signal Line. The difference between the two lines is represented by a histogram. When the histogram lines get longer, it means momentum and volatility has increased, and when they start getting shorter, it implies the momentum and volatility are decreasing. Zero line represents the zero value on the MACD chart, and it does have its own importance when it comes to interpreting the trading signals, as you will see below. The default MACD line settings are 12 EMA (minus) 26 EMA. The signal line is set at 9 EMA of the MACD line. Leave these be. There is no point in finding the holy grail through trial and error. I have tried several setting and the default ones seem reliable…. – add VWAP to charts that feature candles between 1 minute and 30 minutes to see through the MACD divergences and false positives. 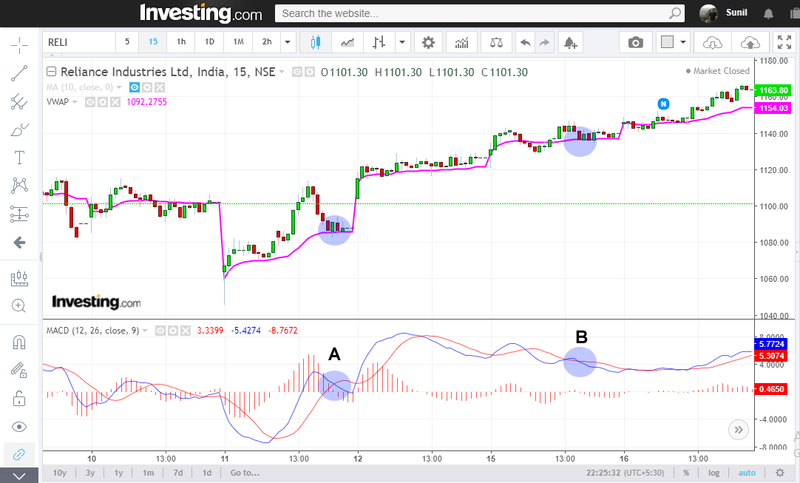 Points A and B in the 15-Minute chart above signal a reversal of trend because the MACD line has fallen below the signal line. A run-of-the-mill analyst will term this as a divergence and confuse the hell out his learners. However, note that the price does not fall below the VWAP, which is a signal that the 15-minute trend is still strong. This is how adding VWAP to shorter period and the 20 EMA to longer periods can help you spot any false positives of the MACD. The interpretation of the MACD follows below, and if you are a learner you should revisit this section after reading through the entire article and understanding how the MACD works. The MACD line is an EMA — and the signal line too is an EMA of the MACD line. It naturally follows both lines will move close to each other. Now here are the signals you have to watch out for – note that this tutorial involves working MACD with VWAP/20EMA. The Zero Line signals are discussed separately. Many MACD followers trade based on Zero line crossovers. You can see that at point A, the MACD line crossed above the Zero Line and the signal worked as the price continued to rise. Even the EMA confirmed the entry. Now check point A. At this point the MACD line crossed below the Zero Line and the signal flopped. In fact, if you had taken based on this signal, you would have lost money in quicktime. What sets apart point A from point B? If the MACD line is at a big distance from the Zero Line, then you should avoid Zero Line crossover signals, especially since you have so many other signals to follow. Now, even though the Zero Line crossover worked when the MACD line was near to it, you will observe from the chart above that the signal was delayed. This is the reason why you can avoid Zero Line signals, especially when you have gotten so many other things working for you. That’s all there is to it. 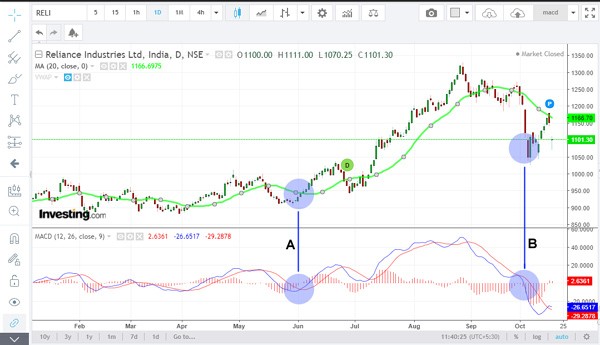 Hope this post helps you understand MACD and apply it profitably. 6 Comments on "MACD Secrets That Can Help You Trade Like A Pro"
Sir, one doubt here, you mean to say if MACD cross over below zero line we need to wait for It to cross EMA 20? 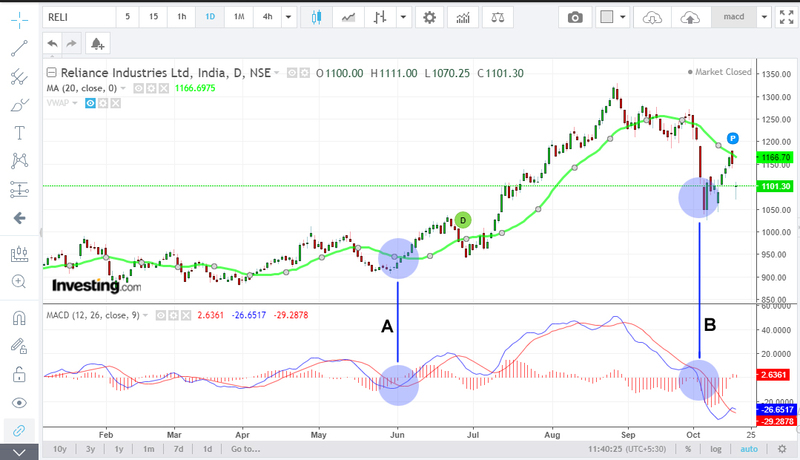 Can you check the Dr. Reddy laboratory weekly chart it showing positive sign on MACD, RSI, tradig above MA 20, 50 and 100. But below 200 day. Thanks for the article. I have read through the article. There are some corrections to be made. Should i point them out? Please do. Also expect a reply. This Worked perfectly in JSW Steel Today on a 15 min Chart. Also worked perfectly on Wipro in Hourly chart. The only problem is to identify when this happens and in which stocks. So for that i guess for that we will have to use a programmed system unless there is a better way out.